1-14 Grade 5 Yellow Zinc Hex Jam Nut 3TG: Does not contain 3TG Contract Catalog Item:Y Diameter: 1" Diameter-Thread Size: 1"-14 Finish: Yellow Zinc Grade: 5 Material: Steel REACH: Y Specification: ASTM J995 System of Measurement: Imperial (Inch) thickness: 0.547" Thread: Fine Thread Size: 14 Type: Jam Nut Wrench Size: 1-1/2" Product Weight: 0.176 lbs. 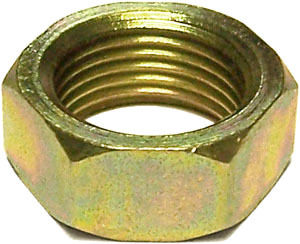 Notes: Jam Nuts are often used to lock or "jam" something in place without clamping against another object; Jam Nuts are typically low profile compared to a standard nut. SAE J995 Grade 5 product marking. ANSI B1.1 UNC and UNF Class 2B thread dimensions. Yellow Zinc offers a modest amount of corrosion resistance, slightly higher than that of clear zinc.